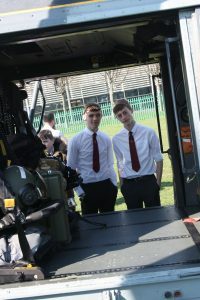 We are both interested in joining the Armed Forces when we are older, having had some experience through cadets. 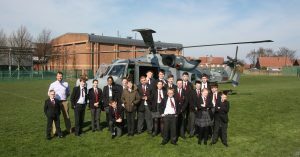 Therefore it was very exciting to get to see the Navy Wildcat when it came into school. The Wildcat is the replacement for the Lynx that was decommissioned in 2015. We had the chance to ask the Navy personnel some questions about their experiences in the Navy, and about the helicopter’s history. This helicopter had not been in active warfare, but was one that is used for rescue and supplies. It has quite a short range of only 250 miles, so is used for tactical support rather than active missions. 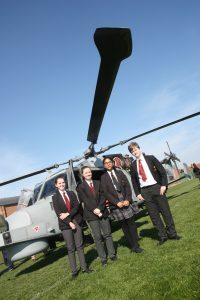 The Wildcat was worth £30 million, with the thermal and laser guidance camera on the front being worth £2 million alone. The fuel costs were also extremely high. We also asked about the different training required for the different branches of the Armed Forces, for example the Marines, which requires six months of fitness training on top of the basic training received by all Armed Forces recruits.